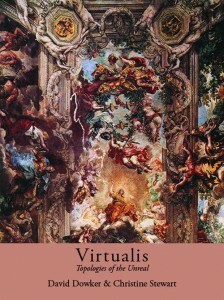 Virtualis is a dense and lyrical book mediated by visionary and philosophical language, commemorating “the vibratory distances between dreams.” Dowker and Stewart use exquisitely ornamental language to exalt the majesty of the senses in poems I found to be radically potent. This book weaves a kind of lexical magic as threads of stunning lyricism and metaphysical fantasia so vibrant it feels like a synesthetic dream. These poems appear as phantasms from the depths of the imaginal – bridging philosophy, musical language, at once odd and angular yet exquisitely crafted, like Brancusi’s Bird in Space. This book includes a reading list of philosophy books that are quoted, including works by Agamben, Deleuze, Benjamin and others. Virtualis functions as a voyage into pure consciousness. 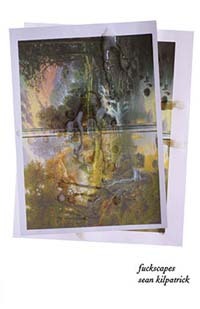 The text’s mindfulness is a rich ore of ekphrastic palingenesis. The mix of some pretty heady philosophical language with soaring lyrical fantasia is something I find totally stimulating: “Our vocabularies maintain subjective principles not immediately apparent as the (inexplicable) lure of verdure.” The book’s philosophical language gives weight to its ethereal fantasia, grounding the book’s assemblage point in a preternatural realm of euphoric convergence weighted in the shells of some spectral egg, creating layers upon layers through which these poems can be enjoyed. “Genus is dissolute. Vagrant is its range. It is the logical effluvium of some proto-binomial urge. Brute geogeny overwhelms ontology. Basic array of itinerant fragrance and mute fruition. Spaces are their own bloom. A gauge of any and several congenital avowals. This rate brain interpretation lichen aligned phosphorous chorus to appall us (o rhodopsin bop voluptuary). 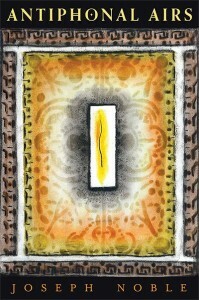 To divulge is lysergic (time-section light-thought in lilt). It is febrile nostalgia. Rapt state. Atavistic splendour of that chymical epoch. There are silences, mania . . . convalescence. This is pretty ethereal stuff, and these abstractions generate a vortex of ideation that moves me as a reader into a realm of ideas for which there are no words. Imaginal texts can lure us to a state of the royal art, Raja-Yoga, where the mind is a kind of kaleidoscope fluctuating between realities all condensed into a multilayered assemblage. I was initially hesitant to read this book and write this review. To even acknowledge the presence of these ulterior intelligent forces, to name them and to give them recognition is to give them energy through the concentrated power of belief. Belief has the power to move mountains, to create and destroy empires. Belief in these nightmarish boogeymen acts as an invitation to them, to allow them to infiltrate the psyche in some subtle way. Weatherly writes, “Traditional lore says that speaking about the djinn too much, or too loudly, will attract their attention and cause them to trouble you. They often take their time, lurking about and learning as much as they can about a person to decide how best to take advantage.” On this note, I encourage readers to explore this material with caution. David Weatherly’s Strange Intruders is a chilling look at the ulterior intelligent forces that manifest as strange entities that have been encountered all over the world. Weatherly specifically examines black-eyed beings, Djinn, shadow people, the Grinning Man, Pukwudgies, shapeshifters, the Slenderman, and other nightmarish entities that come from the periphery. Weatherly focuses on these lesser-known entities that continue to unsettle, and Strange Intruders is revelatory simply because there is scant literature out there on many of these beings. Weatherly examines this rogues gallery of nightmarish entities as well as “the strange nonhuman presence” that accompanies these encounters. Weatherly’s previous book, last year’s The Black Eyed Children, has already become something of a minor classic in the field of high strangeness. 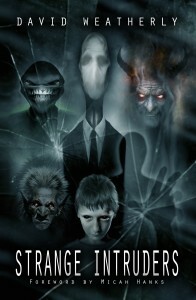 Although Strange Intruders contains a handful of new encounters with black-eyed entities, it broadens his scope to include a variety of entity encounters, sort of like an updated version of The Complete Guide to Mysterious Beings by John A. Keel but with a focus on humanoid entities and the disturbing intelligent forces that hide in a human-like form. Weatherly’s clunky prose and occasional grammatical errors are mostly excusable because serious literature on these entities is hard to come by. These accounts are unsettling at a primal level. One highlight of Strange Intruders is the chapter on the Grinning Man, a tall, thin and oddly dressed man with a freakishly exaggerated grin on his face. Weatherly claims to have encountered the Grinning Man in the late 80s and his experience recounted here is as bizarre and unsettling as any. This theory cleverly modifies a famous belief of Keel’s. Instead of the planet itself being haunted, it is the human psyche that is being haunted. The psyche is fragmented every night through sleep and through dream. When we wake in the morning we often have little or no recollection or what happens in the sleep state. In sleep and dreams we may become vulnerable to these ulterior intelligent forces to infiltrate our intelligence, often in the subtlest ways. Weatherly’s next book is supposedly about Tulpas and thought-forms, and I’d be very interested to see him elaborate on this intriguing theory. However, there is no one theory that adequately explains the existence of all these nightmarish entities, and the unknowable nature of this phenomenon adds to its unsettling nature. In a terrifying chapter entitled “Hiding in Human Form,” Weatherly examines cases where disturbing entities appear as humans who shape-shift into sinister black-eyed beings and other disturbing manifestations. This is reminiscent of Keel’s disturbing look at ‘artificial humans’ and other odd humanoids in The Mothman Prophecies. Mouth of Hell is inspired by Manuel Mujica-Lainez’s Bomarzo, a novel I’ve never read, which itself is based on the eccentric Duke Pier Francesco Orsini, a 16th century nobleman who commissioned a sacred garden of monsters to be built in his honor. 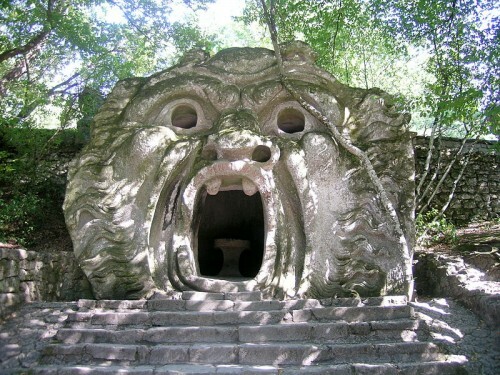 Negroni’s Mouth of Hell is composed of brief untitled prose poems, the proclamations of the decadent aesthete Orsini at the exact point of his death, which occurs inside the garden’s hellish grotto. 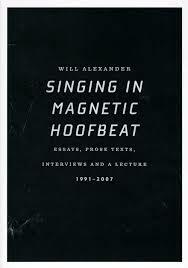 These poems act as jolts of energy and are the culmination of a peculiar life as seen from the edge of consciousness. Jorge Monteleone’s superb introduction and the translator’s preface do excellent service to shed some light on the historical Duke Orsini as well as the novel Bomarzo. This convergence of sources and voices sort of mirrors the fragmentation and reconstitution of selfhood that occurs in these poems, all happening in the heightened reality of the monstrous sculpture garden, “my biography and my park of monsters, who I’ve despised, envied, admired, and loved, deep down, terribly.” Speaking of the park’s sculptures, Orsini said, “Each rock represented an enchanted figure, in my memory or imagination.” Each poem in Mouth of Hell could do the same, creating a fascinating interplay of life, art, creation, dissolution, and rejuvenation of the senses. Mouth of Hell, in part, chronicles a human soul gaining knowledge of itself upon death. These are finely tuned revelations of deranged nobility, commemorating “a lascivious earth to an uncertain beyond, the thread of my hallucinated life.” These are memories, sensations, fantasies, and proclamations of “the body whirling into conviction” at the brink of death. For this reason it occasionally feels like a radically condensed take on Dante’s Inferno. Orsini’s garden of monsters remains after hundreds of years a singular artistic oddity. Monteleone informs us that above the crude demonic mouth is the inscription, “Lasciate ogni pensiero voi ch’entrate,” which can be translated, “Abandon all thought ye who enter.” This curious variation on Dante’s famous line suggests a total annihilation of the personal self. A journey into the underworld is nothing less than a chance to merge with the archetypal, with the infinite formless monsters of the abyss. The sculpture garden, “the estate of the sensual,” is a monument of excess, and the demonic face that graces the cover of this book is as comically grotesque as any of Iron Maiden’s album covers. The opening of the mouth serves as a meeting place of two worlds. Just as death is the edge of life, the brink of the abyss is the edge of the visible. Antiphonal Airs interacts with the musical vibration of “transforming what is unseen into what is heard / what is unheard into what is imagined.” These grandiloquent gestures soar through entirely agreeable intonations, creating an excellent sensory experience. Here the music of poetry is refracted through early Italian Baroque music. Noble explores little-known yet magnificent composers, such as Nicola Matteis, Marco Uccellini, Giovanni Legrenzi, and Sigismondo D’India, to name just a few. As a classical music lover, this is pure delight. On the similarities between poetry and music, Noble writes, “they both use sound, both take place in time, both seem to move with a fluidity of association at times, both have a sensual dimension to them, both can be an outcry or a whisper and everything between, are articulations of vibrating air, and both are avenues of enlightenment.” Antiphonal Airs is full of rich and vibrant poems, their lyrical nature echoing and reflecting the work of master composers. On Elegance While Sleeping is a decadent and deranged Argentinean novel, first published in 1922 and spanning four years in the life of an aesthete whose fluid diary entries function as a recollection of dreams, memories, visions, sexual fantasies, mundane observations, musings on death and the animal kingdom. These vignettes have the cumulative effect of a fractured psyche indulging in its own incompleteness. Sinister and surreal, each locution is touched by the flavor of elegance. 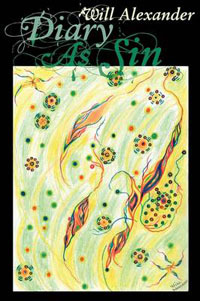 It is a fantastic and dark marvel of a libertine’s fractured psyche, a damaged consciousness. Tegui’s novel feels like a spiritual cousin to Pessoa’s The Book of Disquiet and Rilke’s The Notebooks of Malte Laurids Brigge, these short and intensely interior novels deal in the anguish and ecstasy of poetry and isolation. 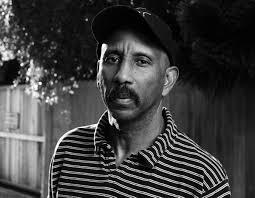 Tegui writes, “Novelists overplay their hands when they put an end to their characters with some catastrophe—a terrible fire, a murder, what have you. They don’t trust in the asphyxiating monotony of everyday life.” But this novel has a darkness and subversive element that extends beyond sheer idleness, making it feel like the Argentinean counterpart to such subversive decadent classics as Maldoror, Aurélia, and A Rebours. In the delicate balance of dream and reality lies the annihilation of illusion. 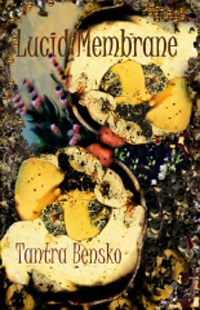 Tantra Bensko’s sensual unveiling relates to the intelligence of crystals. She is adept at the unknown: dreams, twilight language where thought relates to the imaginal, emblematic of the seer’s paranoid awareness and lucid view. The lucid aesthetic is kaleidoscopic and freewheeling in its engagement with metaphysical realities that extend far beyond the realm of fiction and delve into the heart of energy, and the imagination itself. Cosmic and personal, the molecular weight of the hermetic text manifests itself through capricious and fanciful dreams through Bensko’s steady and remarkable vision. These stories are inextricably tied to alternate dimensions and mental travel, skirting at the edges of the astral plane, and Bensko desires the astral form here—in life, so that great fruits may come. Bensko writes, “I wish the people I’m living with, on my own invisible frequency, could understand that I am weaving myself through their cells, through their dreams, their breath, their love.” It is with sweetness and an alien lucidity that these stories exist. Like the labyrinthine explorations of Borges—echoes from the invisible drift into the unaware oceans with mysterious interpretations of shape and tone, stained with colored language. In Bensko’s stories ethereal waves skim over the astral surface between the world’s heart and all that bleeds. Emanations of some imperceptible astral dust covers all things, in the shimmering shadows of formless force – giving it shape, with lucidity and spirit. Like shadows – like a mirror – space, sound and color interact and create a dynamic that denies any nostalgia for conventional structures through a manifestation of the unseen. 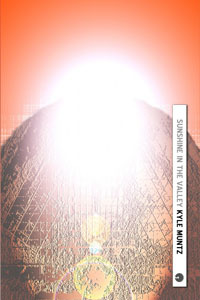 Through its ecstatic sweep and baroque grandeur, Sunshine in the Valley by Kyle Muntz espouses rays of creation that both illuminate and transfigure the atmosphere. It has an ethereal quality of infinite expansion, with a poetic opulence relating to a kind of freedom without a hint of anxiety or any inhibition. The feeling is like embracing the sky in fullest light – a celestial glow imparting splendor bathed in Uranian auras of mystery and rapture. Gazing through this diamond prism is a true delight.